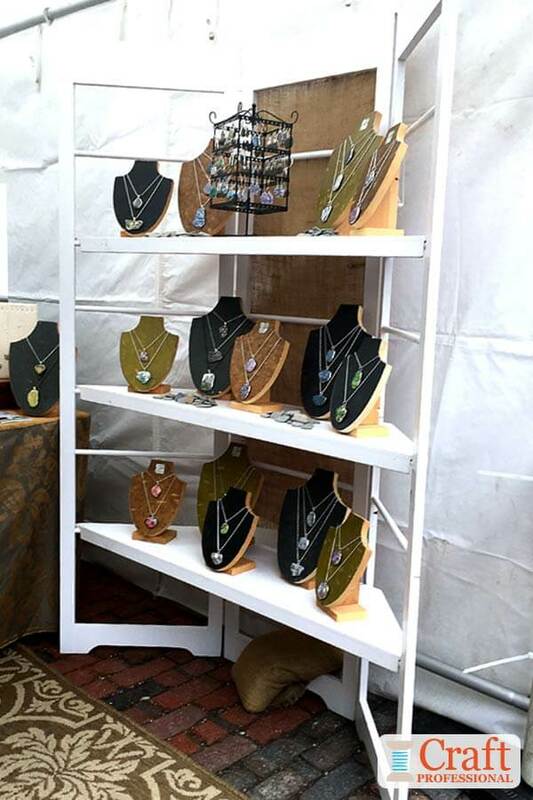 To help you display jewelry effectively, I have 5 photos of two different booths at an outdoor craft show. 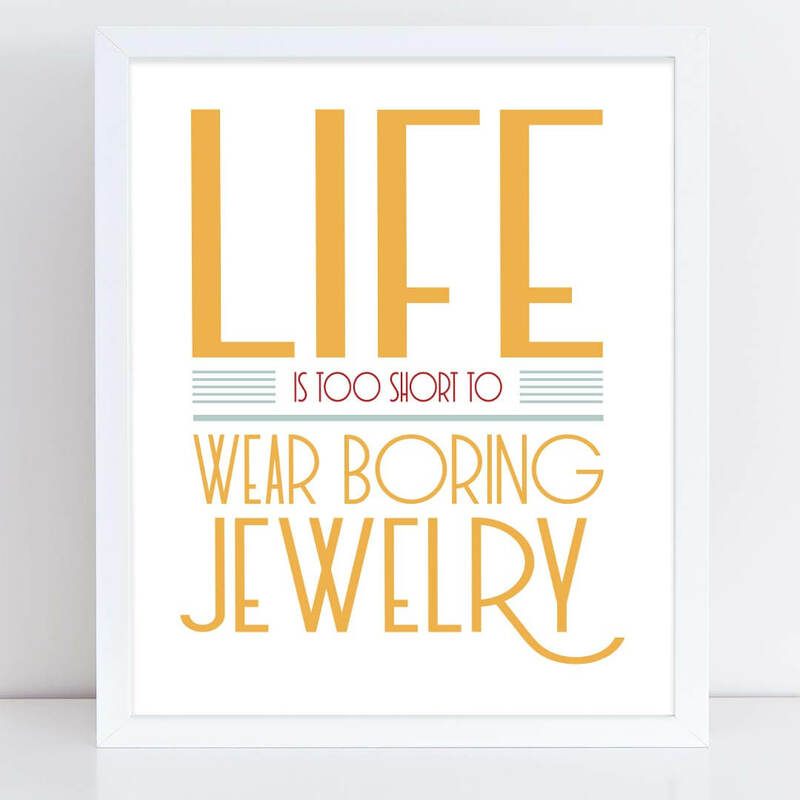 I hope you'll find plenty of inspiration in these displays. The first two photos show a booth that's effective and simple to put together. This display on folding tables is tied together by a fresh color scheme of blue, white, and brown. 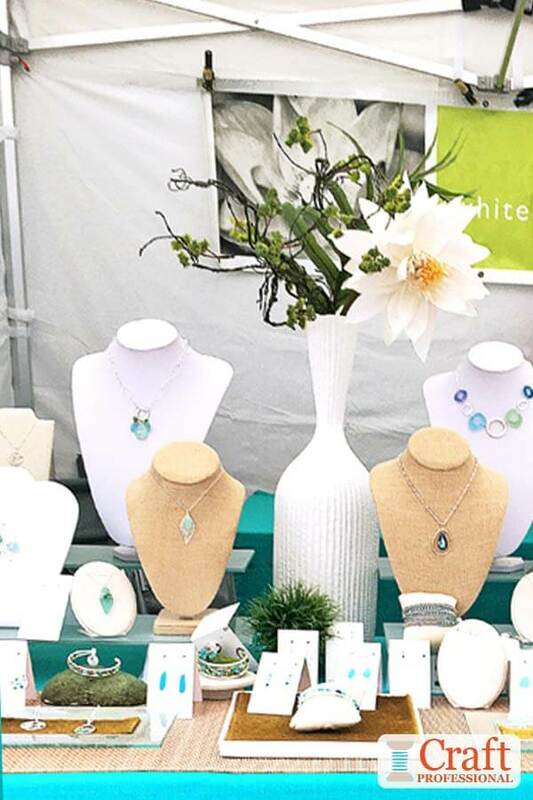 If you look closely at the jewelry, you'll see it all features shades of blues and greens that are similar to the table covering. Risers at the back of the tables add height and prevent items at the back of the display from being hidden. Using a variety of styles of necklace busts helps to break up the display, so your eye moves around the space, but sticking to a clear, neutral color scheme unifies it all. Striking fresh flowers are a simple way to add drama and elegance to the booth. 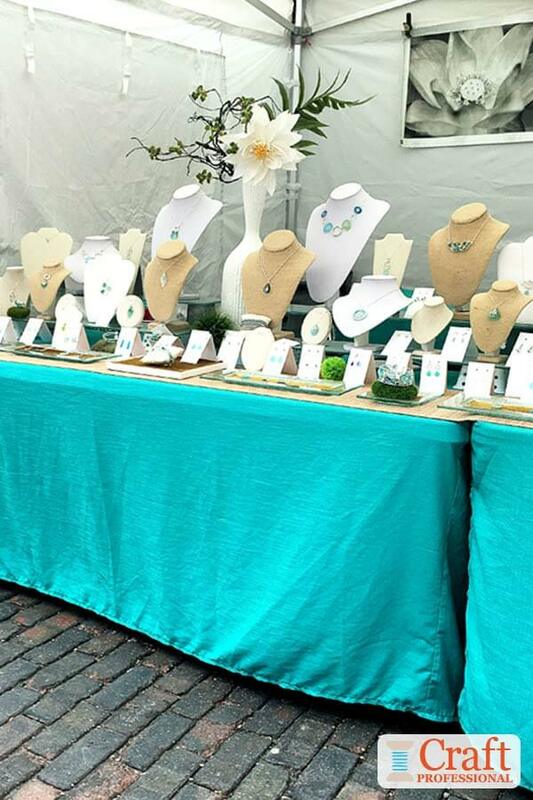 Next, I have three photos of another jewelry booth at the same outdoor show. 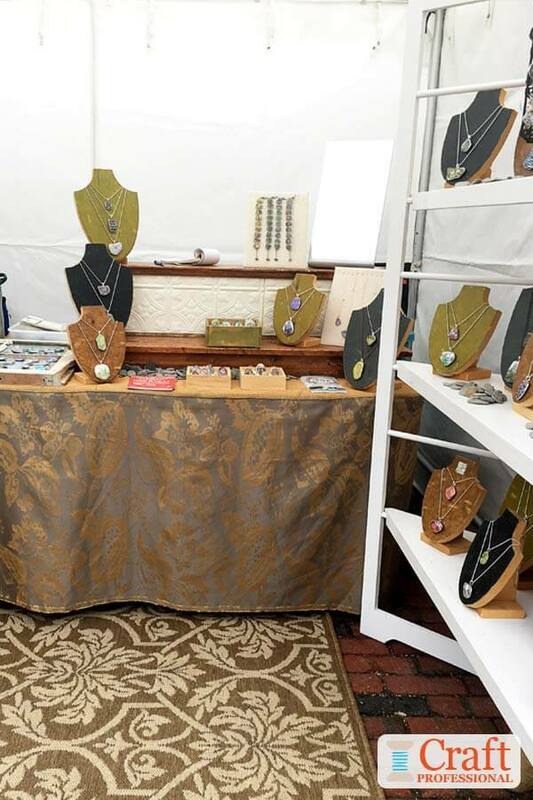 This one also uses a tabletop to display jewelry, but the table is moved toward the back of the display space in this case, and it's paired with two portable shelves on each side of the table. The first two photos (below) show the left and middle of the booth. The shelves used in this booth appear to be quite portable and very likely fold down easily. Notice the sand bags at the base of the shelf. 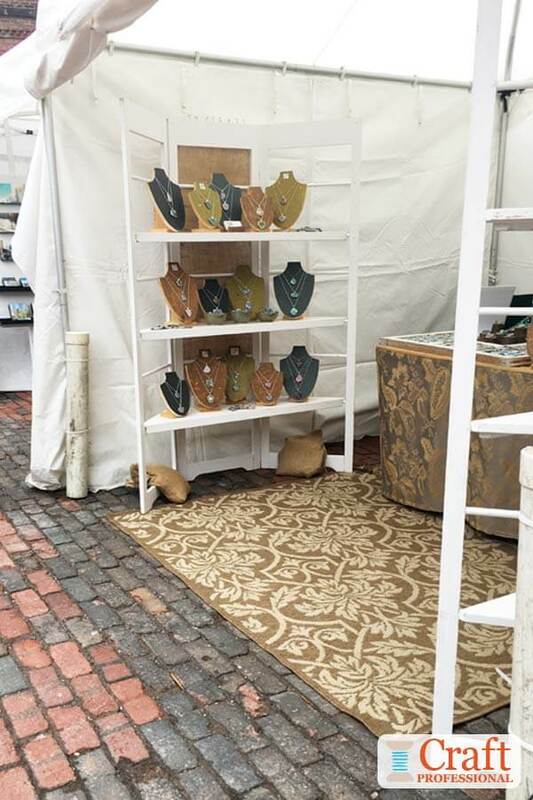 They help provide stability, which is particularly important in a booth space like this one on uneven cobblestone streets. The color scheme of green, black and bronze is a refreshing change from more standard color schemes and helps to draw attention to the booth. I've never seen commercial necklace stands in this exact color, but they are wood, and could easily be painted to suit the color scheme. The photo on the left provides a closer look at the portable shelves used in this display. Again, there's a sandbag in place on this side as well to make the shelves more secure. 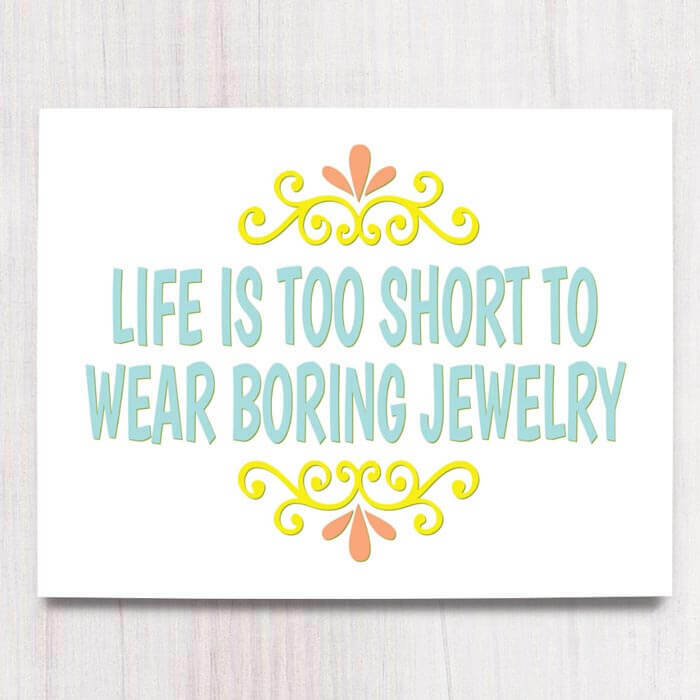 Notice there's some variety in the sizes of the necklace busts on the shelf. One danger of displaying items on a series of shelves is you can end up with unbroken rows that work well. 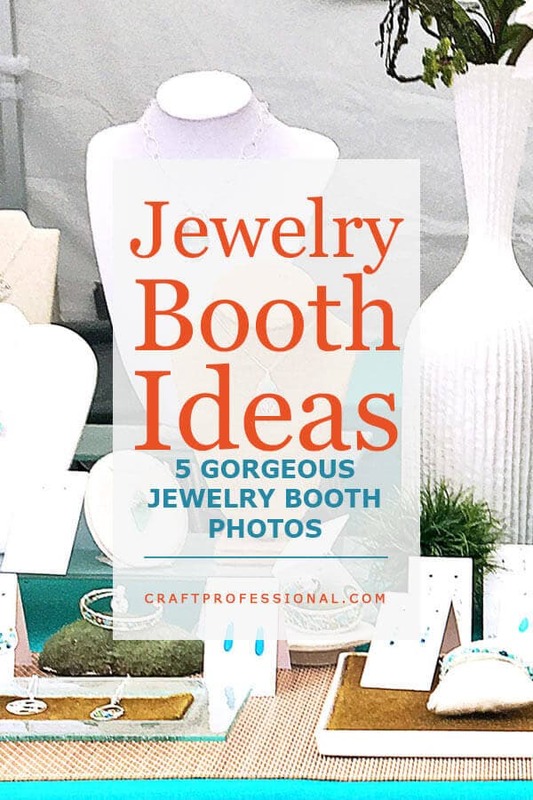 By using a a couple of different sizes of necklace busts, along with combination of three colors, this jewelry maker avoids that problem and creates a display with good visual interest. 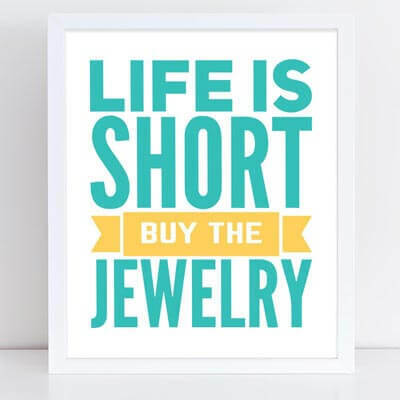 Signs for your craft booth encourage your customers to live a little and treat themselves to your fabulous handmade jewelry.